Figs bring out strong emotions – some people love them, some people loathe them! Most of us here at Bay Laurel are in the first category. Figs are indigenous to Asia Minor and are one of the first fruits to be brought under cultivation. They have been a part of the Mediterranean diet for centuries. Many varieties were grown in the days of the Roman Empire and now more than 200 fig cultivars have evolved. 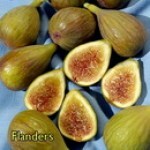 As you will note, we do not guarantee figs because of their sensitivity to drying out. However, in the last few years, our growers have been able to provide us with very well-rooted plants and the success rate for figs has been notably improved. Although figs are generally associated with Mediterranean climates, there is a Canadian supplier of figs and die-hard fig lovers in extremely cold climates find ways to overwinter them, either by wrapping them or growing the plants in movable containers. Some of the smaller varieties are best suited for container planting, such as Black Jack or Violette de Bordeaux. Fig trees are a handsome addition to the landscape because of their large, shapely leaves and graceful form. They are effective as an espalier against a wall. In some relatively cold climates, the tops of the trees will freeze, but they quickly recover. They have even been known to freeze to the ground in certain areas and re-establish themselves from the roots, since fig trees are not grafted. Dark colored figs tend to be the most popular, but we have found one of the advantages to growing the lighter ones is the birds seem to think they are not ripe and leave them alone! In our area, gophers are a real problem and they have a great love for fig roots, so if you have a gopher population in your area, we strongly advise planting the trees in a wire basket. Fig trees do not require much fertilization or water or pruning. They are wonderful eaten fresh off the tree, but if you have an abundant supply, drying is a good option. There are many unusual ways to use figs – they can be grilled on the barbecue and served as part of the main course. They can be used in breads and cakes or stuffed with various cheeses. Here’s an unusual appetizer using fresh figs. Combine 2T. oil, 1/4 cup vinegar, 1 1/2 T. rosemary, thyme and black pepper. In a separate bowl, combine remaining oil, vinegar, rosemary and black pepper. Add figs, toss gently to coat and set aside until chicken is finished marinating. Thread the chicken and figs onto skewers, alternating as you go. Season chicken and figs on both sides with salt to taste. Broil until chicken is lightly browned, about 5 minutes. Turn skewers and broil until chicken is cooked through, about 3 to 5 minutes. The favorite fig. Purplish black skin, strawberry colored flesh, rich flavor. Heavy bearing, long-lived, large tree. Coast or inland. Fresh/dry/can. Cold hardy to zone 7. 100 hrs. Self-fruitful. NOTE: Due to their sensitivity, figs are NOT guaranteed. 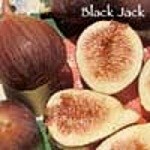 Excellent quality small to medium sized fig with purplish brown skin. Fruit is white, shading to rose at center. Firm, juicy, very sweet. Has two crops--early summer and early fall. Widely adapted. Can be pruned to any shape. Cold hardy to zone 7. 100 hrs. Self-fruitful. NOTE: Due to their sensitivity, figs are NOT guaranteed. Purple brown fig with great flavor. Good cold tolerance to zone 4. Can die back to the ground and come back and fruit that season. Fruit is produced on summer growth. Plant is purported to be hardy to 10 degrees and roots to -20 degrees. 100 hrs. Self-fruitful. NOTE: Due to their sensitivity, figs are NOT guaranteed. Light greenish yellow skin, pink flesh. Flavorful fig; not as sweet as Kadota, but resists spoilage. Use fresh/dried. Very vigorous, long-lived tree. Heavy crops coast or inland. Cold hardy to zone 7. 100 hrs. Self-fruitful. NOTE: Due to their sensitivity, figs are NOT guaranteed. Violet striped fig with white flecks. Richly flavored amber pulp, resistant to splitting. Plants are vigorous and highly productive. Hardiness best suited to the West Cost. Cold hardy to zone 8. 100 hrs. Self-fruitful. NOTE: Due to their sensitivity, figs are NOT guaranteed. Large, sweet, delicious, light greenish yellow fig with practically no seeds. Prolonged harvest, Aug.-Nov. Suited to coastal and inland climates. Prune to any shape. Cold hardy to zone 8. 100 hrs. Self-fruitful. Pat. Pend. NOTE: Due to their sensitivity, figs are NOT guaranteed. Large fig with light greenish yellow skin, amber flesh. Very sweet fruit needs hot weather to ripen. Long-lived, vigorous tree can be pruned to any shape. Fresh/dry/can. Cold hardy to zone 7. 100 hrs. Self-fruitful. NOTE: Due to their sensitivity, figs are NOT guaranteed. Greenish yellow fruit with sweet honey colored flesh. Good for fresh eating, canning or drying. Produces fruit on new wood. Well adapted and is one of the most widely planted figs in the Northwest. Cold hardy to zone 7. 100 hrs. Self-fruitful. NOTE: Due to their sensitivity, figs are NOT guaranteed. Especially fine flavor! Small to medium sized fig with green and yellow 'tiger' stripes. Strawberry pulp is blood-red color. Cold hardy to zone 8. 100 hours. Self-fruitful. NOTE: Due to their sensitivity, figs are NOT guaranteed. Prolific fig from Sicily. The skin is shiny, yellow-green when ripe and the sweet flesh is amber colored. It produces in early summer and late summer; the second crop ripens early enough to avoid frost damage. Good for fresh eating, drying and canning. Cold hardy to zone 7. 100 hours. Self-fruitful. NOTE: Due to their sensitivity, figs are NOT guaranteed. Very sweet flesh. 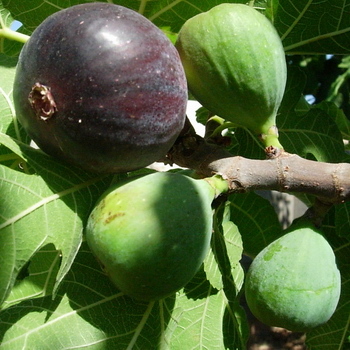 Fig is small to medium size with dark purple skin. May bear twice a year if conditions are right. Ripens August to November. Cold hardy to zone 6. 100 chill hours. NOTE: Due to their sensitivity, figs are NOT guaranteed.